High Power 24V (27.2V) power supplies with for audio and battery backup applications. Due to voltage-fold back current protection, these high current, high efficiency power supplies can be used in parallel with 24V lead acid batteries in order to provide extra power boost. High efficiency, switchmode power converters. These AC-DC power supplies have a nominal output voltage of 27 volts. They were originally designed to power automobile audio systems in demonstration rooms and trade shows. They have very low ripple and no audio noise. Other output voltages can be made upon request. 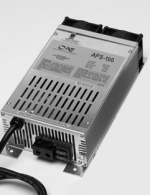 These AC/DC Power Converters are ideally suited for the mobile environment. These power supplies feature regulated and filtered outputs which allow for clean audio demonstrations without the slightest hint of noise. Their low profile design allows for convenient mounting under a display vehicle or behind a display board. DLS series power supplies may be used with or without a battery. When combined with a high quality battery, DLS units can supply transient surges up to 500 amps. Can also be used in installations where use of a battery is not possible. All models offer dual voltage output. (27VDC - 28.8VDC) with a removable jumper accessable from the outside. 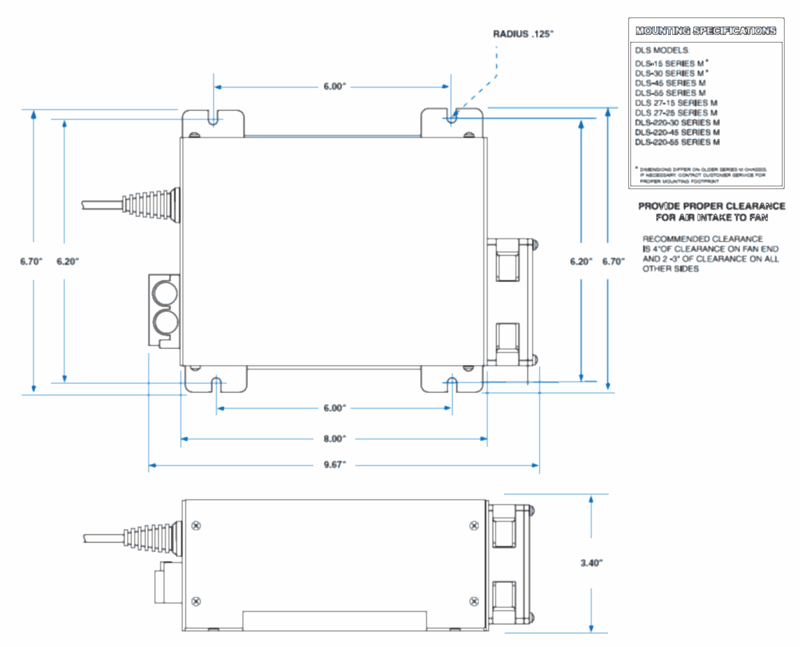 Virtually Silent Operation All DLS Power Supplies utilize an advanced switching design. There is no low frequency transformer hum. Every unit is equipped with a cooling fan that is virtually silent. The PST-DLS Power Supplies all feature thermal control circuitry that engages the fan only when internal temperatures require it (typically 75% of full load). They have small compact sizes compared to the transformer based power supplies. The switch mode technology utilized in DLS Power Supplies boasts 86% efficiency. 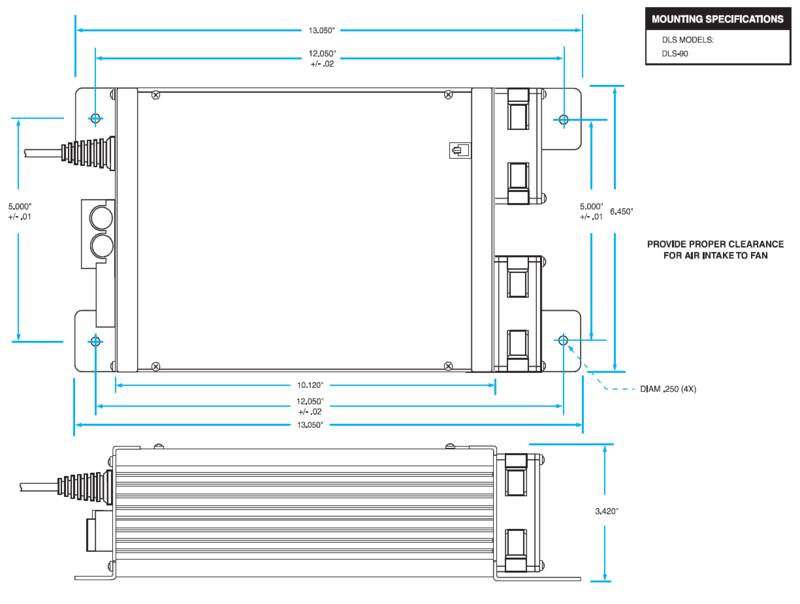 This superior design results in cooler operating temperatures and compact size. Up to six of these lightweight power supplies (identical models only) can be connected in parallel for even greater current capability. **The dual-voltage feature allows the voltage to change from 27 to 28.8 volts by inserting jumper into a socket on the outside of the charger. Typical AC outlets are 1540VA, 14 amp service. To run the higher power units you will need higher power service. Please consult competent technical authorities to determine the total load on the circuit you intend to supply the power with, including other things plugged into the same line.